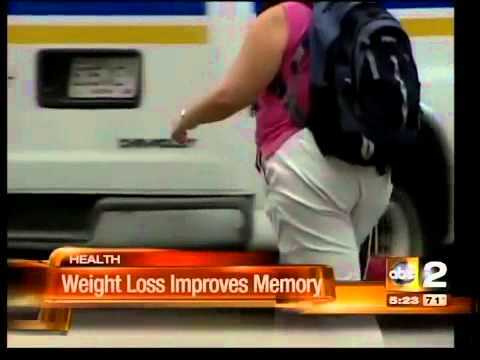 Can Weight-Loss Improve Your Memory? Here’s another good reason to lose weight: It may improve your memory and concentration, new research suggests. According to new research substantial weight loss improves brain health. Though everyone occasionally blanks, some lapses are more cause for concern. The morbidly obese patients, whose weight stayed the same, showed a mild decline in memory. The improved memory for the surgery patients likely is not solely due to improved blood pressure, because only a small number went from being classified as having hypertension to no longer having it, Gunstad says. Michael Devlin, another author on the study and a professor of clinical psychiatry at Columbia University, agrees it’s important to emphasize not just losing weight but also adopting a healthy lifestyle —healthy eating and healthy activity. Duke UniversityMedical Center professor Murali Doraiswamy, an Alzheimer’s expert who wasn’t involved in this research, says, this is “a pioneering study” because it shows treating obesity might improve memory. More research is needed to see if mildly overweight people experience similar improvements with weight loss through exercise or diet, he says. Gunstad and colleagues will continue to follow the participants for two years. The study, published online this week in the journal Surgery for Obesity and Related Diseases, was funded by a grant from the National Institutes of Health. There’s a benefit of working out that you don’t hear a lot about: it’s building the muscle between your ears. That’s right. An intense workout vastly improves brain function, memory and mental acuity. Last week I met someone who is living proof that regular exercise improves brain function. After the first five minutes of speaking with her, I noticed that she had a super quick response time to questions. No ums, ahs, ya-knows or hesitations. Sure enough, she revealed that she has been running since college. For several years , she can easily run 10 to 15 miles a day in very minimum time, and was physically active between 5 to 6 days a week. Clearly this is someone who is fit on a very advanced level. After training hundreds of clients over the years, I’ve consistently observed a major correlation between the intensity of your workout, your memory, and mental agility. A challenging workout keeps your mind operating at a peak level. But intensity is very difficult to achieve on your own. This is the primary reason why people hire me– they know I’ll push their limits and deliver results. Some trainers are lazy themselves and waste 10 or 20 minutes or even half the session just talking. I provide continuous instruction and make every minute of every session count. Another thing that distinguishes me from other trainers is that I’m extremely observant. I read your body language , listen to the tone of your voice, and study your facial expressions to determine your mood and current state of mind. That way, I can tailor each workout so I know you can give it your all (and get the most bang for your buck). Here’s another observation:The majority of my clients didn’t lose their jobs during the recession. In fact, most of them received promotions and better positions. Could working out intensely with me have given them a leg up over everyone else? Stay on top of your game at work, with your family, and with yourself by increasing the intensity of your workouts. Nothing goes better with a beautiful body than a beautiful mind. This entry was posted on Tuesday, June 28th, 2011 at 10:18 am	and is filed under Fitness, Mind / Motivation. You can follow any responses to this entry through the RSS 2.0 feed. You can leave a response, or trackback from your own site. Great post, Alan–one of your best. Do I recognize my cousin, Debra, as the sharp runner? She’s also an ultra-successful contract lawyer who keeps getting promoted when others are let go. She’s fired-up and has led an exciting, active and adventurous life. Everything you write about your training practices and techniques is true. I can vouch for it–not only the dedication and observation but also the great results. Hope you can keep my mind in shape until at least 90.